It’s June, so of course the roses are out, including the first flush of the climbing roses, to be repeated up until December, and the much briefer wild dogroses. Geranium ‘Johnson’s Blue’ is gloriously out, and so in a Great-Dixter-like contrast/clash is the scarlet-orange oriental poppy. 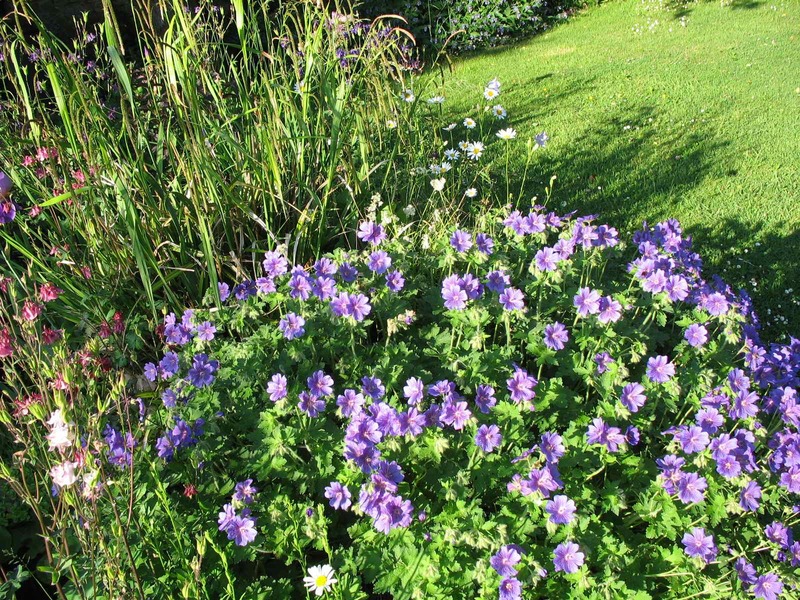 Geranium ‘Brookside’ has started flowering near the pond, and will flower repeatedly until the autumn. My powder-blue veronica is out too. 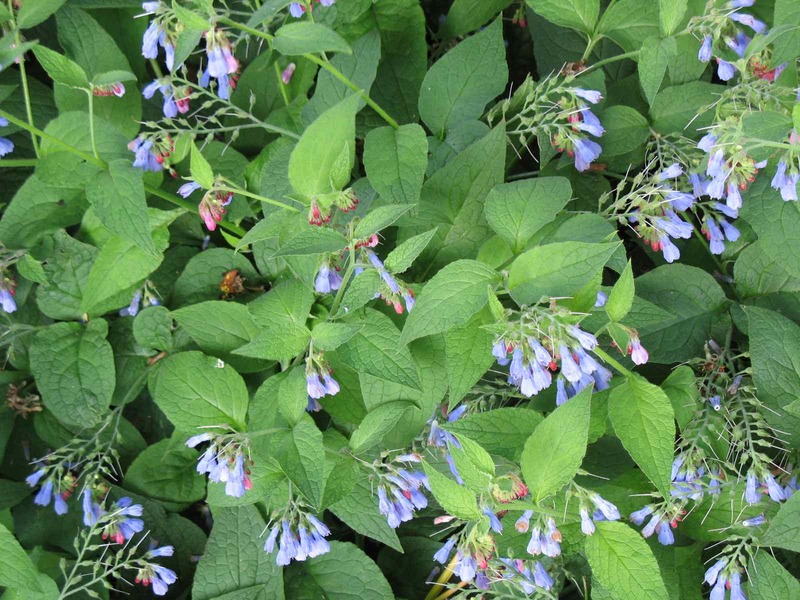 And bees are frantically searching in the comfrey flowers for nectar. Near them are the yellow Welsh poppies – orange ones out elsewhere in the garden. In another bed I am going to treat for couch grass, alchemilla mollis has survived, with fresh green pleated leaves unfolding which catch the rainwater nicely. Near this is a beautiful white geranium with delicate purple veins: Geranium clarkei ‘Kashmir White’, and also a pure white geranium sanguineum which has pretty finely-divided leaves. For the shrubs, the pyracantha hedge is in full creamy-white bloom, so I have red (valerian) white (pyracantha and oxeye daisy) and blue (Geranium ‘Johnson’s Blue’) out in the front of the house (see photo to the right). What’s fading: the aquilegias have all been pollinated by the bees. Now’s the time to cut down any you don’t want to self-seed. The irises are carrying on a little longer. I always thought my garden was mainly a spring one, but now I realise it carries on into June. The philadelphus will be coming out soon too with its orange blossom scent. 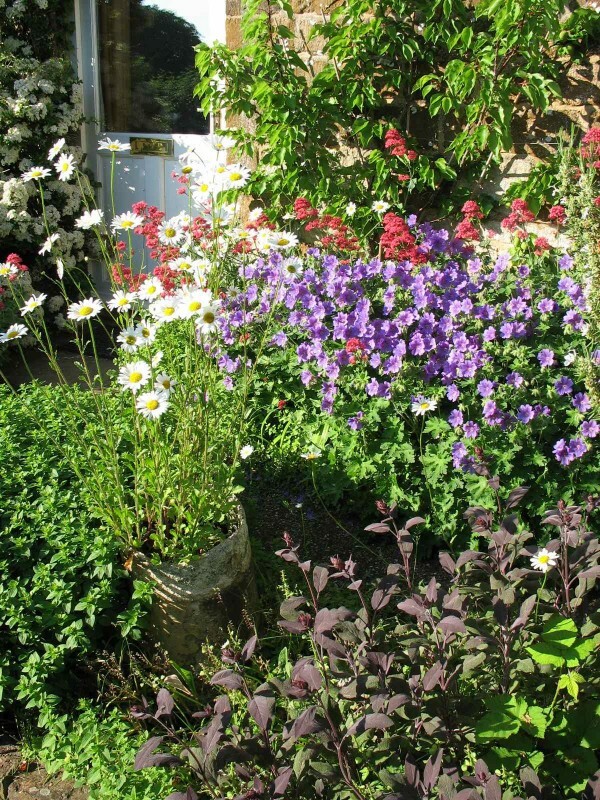 In autumn, I will have the asters and the leucantheum (which used to called chrysanthemum – it’s a sturdy white daisy with yellow centre), as well as the grasses and verbascum which is spreading its huge gray-green leaves (good ground cover!). Also cyclamen under the trees and a little maple, and a vine, which both have flaming leaves.. things are looking up! Now to close the gap with a couple of pots of bedding – geraniums, and cosmos I’ve grown from seed (that’s an annual). And there are the vegetables to tend as well. I will be busy!